Noemi Luna, 22, from Chicago, born in Mexico. Sitting on a bus one day in high school, I looked around and wondered about the life of each person. Just the day before I had won first place in a cross-country race for my high school. I felt special. I knew that no one on that bus knew my story. No one knew what I had gone through to be where I was and to get first place. Then, I realized, I didn’t know anyone else on that bus. I didn’t know their stories. I could’ve been sitting next to a veteran. I could’ve been sitting next to a previous chess champion or even the CEO of an important company. Using this example for DREAMers, I imagined a bus full of undocumented students. We don’t know their stories, and we also don’t know their capabilities. One of them could be the next billionaire or the person to find a cure for cancer. Without higher education, these goals are limited. However, giving DREAMers higher education is a step towards helping these students better our societies. America is all that I have ever known. Growing up here has been a true blessing. We have always had a roof over our heads and food on the table. It has truly been the land of opportunity, and I genuinely believe that, despite the difficulties my family has faced. There are seven people in our family. My mother and father were both born in Mexico and received bachelor’s degrees. My mother went on to be a nurse, and my father a mechanical engineer. They moved to the United States 20 years ago and are currently undocumented and working in other jobs. I was two-and-a-half years old when we came to this country – some of my early memories are of the seven of us living in a three bedroom apartment. Even though we were tight, we were hopeful that better days were ahead. 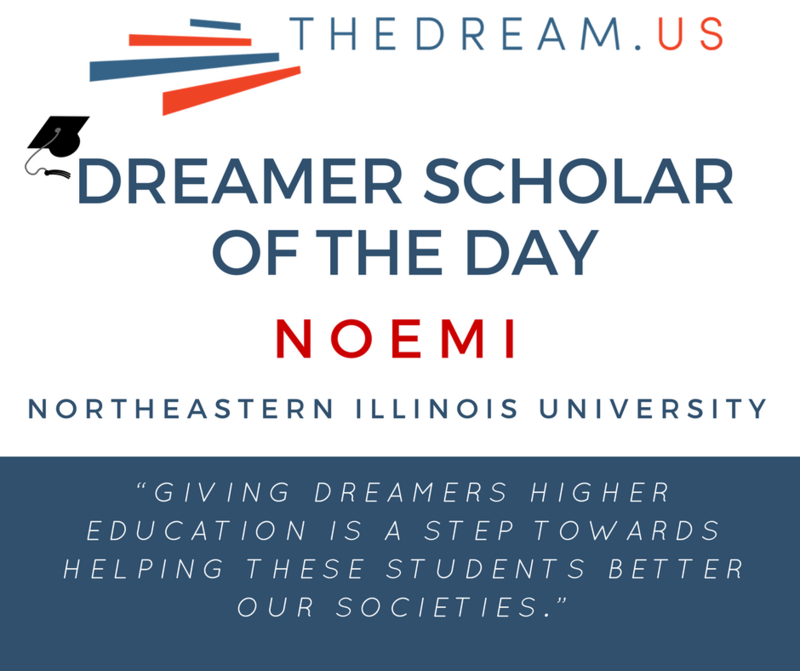 Prior to receiving TheDream.US, I decided to attend Northeastern Illinois, unsure of how I would pay for it. One day, I was scrolling through my emails, reading about events that I would be unable to attend because of homework and work. But one caught my eye. It said “Informational Session for Scholarship for DREAMers.” Upon reading it I noticed that I would qualify for the scholarship. Right away, I called my sister, and we attended the meeting. Without TheDream.US, I am sure that I would still be working long hours with my father, earning minimum wage. As a student, I work full-time at a local charter high school as an Administrative Assistant. It fills my heart with joy watching students come to the program, grow, and graduate. It fills me with so much hope for my own future. To other DREAMers I would say: You’re being given the chance of a lifetime, take full advantage of it and change the world. “Start strong, finish stronger,” as The University of Chicago Collegiate Scholars Program would say. Losing DACA would mean losing everything I have worked towards since I arrived here. My goal is to continue to help my community and students. I aspire to become a psychologist or engineer and help people solve problems that seem hopeless, but in reality, just need some extra attention, hope, and hard work.